When you think of poodles, you probably think of how regal and beautiful they are, not to mention their soft curly coats. These dogs are loyal, sociable, and of course intelligent too, but to keep your pooch in tip-top shape, it’s important to feed them the right food. 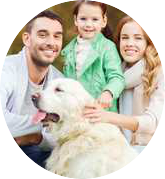 Whether you have a toy poodle, miniature poodle, or standard poodle, the right food will give him the energy they need to greet you happily every day. Royal Canin focuses on each breed of dog to create the perfect food for that breed’s needs. They also have different stages to choose from, based on your Poodle’s age. This food is perfectly sized and texturized for a Poodle’s mouth size and shape. This will make it easier for them to eat. This food is formulated to help your Poodle’s coat stay healthy. It will also help them age better and keep muscle. This is a great option for an adult Poodle. This breed specific dog food is made specifically for Poodle puppies. It is made to match their jawline and mouth shape, which helps them chew their food easier. It will help them age in a healthy way and keep their coat healthy as well. This food is designed for Poodles up to age 10 months. After 10 months, you should switch them to the adult formula. It has vitamins and nutrients to keep the intestinal flora balanced in your Poodle. It also gives them everything that they need in a balanced diet. Best Breed Poodle dog food is a holistic food specially made for your Poodle’s muscle and coat health. It is rich is Omega fatty acids to keep their muscles lean and healthy. It will also help keep their coat shiny and healthy. For this dog food, you have different flavors and sizes to choose from. Some flavor options include beef, lamb, chicken and venison. This food is high in protein and grain free, making it one of the best options for your Poodle. The meat in this dog food is freeze dried, and raised in a healthier way. This is an all natural dog food with probiotics to help improve your dog’s digestive health. It also has Omega acids to keep their coat healthy. This is one of the healthiest options for your dog. This wet dog food is made to go with their dry food. You could use this as your Poodle’s primary food, but they would be better with the dry food. This could be an added treat every once in a while. Or you could give it to them once a day. Just like their dry kibble, this food is specially made to support healthy muscles and coats. Eagle Pack offers this dog food in different sizes and flavors. Some of the flavors include chicken and pork, lamb and rice, and also reduced fat options as well. This natural food is made in the USA and is researched to ensure it is healthy and meeting your dog’s dietary needs. It contains no corn, meat by-products, or preservatives. The proteins in this food will be easy for your Poodle to digest. It also contains flaxseed to keep your dog’s coat healthy and shiny. Other natural ingredients and antioxidants will boost your Poodle’s immune system as well. This food is available in different bag sizes. You could also choose which size kibble based on your dog’s breed size or age. The different options can be helpful, especially if you own other dogs, not just your Poodle. This dry dog food is formulated to keep your Poodle’s skin and coat healthy. It also will help improve and promote good digestive help as well. Some dogs have a hard time digesting their food. The ingredients in this food are simple and healthy. They also use the minimal amount of ingredients that they can, not exposing your dog to more than they need to be. This is a great option, especially for a Poodle that might have allergy issues. This canned dog food comes in different flavors, such as lamb, liver, turkey and chicken. Rest assured that it is certified by the USDA as an organic dog food. Low in carbs, but it will help boost your Poodle’s energy levels. It’s easy to digest and provides a complete and balanced nutrition. You can use this as a snack, add it to dry dog food for more flavor, or use on its own as a meal. Your dog will love the flavor of this food! Many dog owners comment on how their canines just gobble it all up. This dog food is protein based for proper gut health in your Poodle. It contains probiotics, fiber, and prebiotics, so it’s easy to digest and promotes gut health. With fatty acids, minerals, and vitamins, this food will boost your dog’s immunity and coat. The carbohydrates in this food will help boost their energy, to keep them healthy and active. It also contains nutrients for healthier eyes, gums, and teeth. If your Poodle is a show dog, this is a great choice for it. You can also choose which type to buy based on size, age, or dietary needs. This formula is for smaller breed puppies. Great for a mini or toy poodle! It is specially designed to help a puppy after they are weaned from their mother. Puppies go through big growth spurts, and they need extra nutrients and vitamins to help their growing bodies. It also helps their immune and digestive system mature and stay healthy. It also promotes healthy teeth and skin. You never want to give them too much or too little food, so the first thing to consider is the size and weight of your fury friend. Of course, if you have a poodle as small as 6 pounds, they’ll eat less than a one that’s as heavy as 70 pounds. Is your dog an active pup? If you notice your dog running around a lot and expending a lot of energy, they will naturally need more food compared to a more relaxed dog that likes to lounge around. As your poodle ages and their lifestyle changes, monitor how much energy they’re using. Puppies need more food to keep up with their growth and energy, while senior dogs will naturally move less and therefore eat less. Adjust your dog’s food intake to match their needs as they age. Nutritional content varies from product to product, which is why you should count calories rather than cups. Toy poodles are the smallest, and will only need around 300 calories a day, whereas miniature poodles will need around 490 calories. As the largest breed of poodle, the standard poodle may need around 1,230 calories, but remember that these numbers are only an average. Depending on how active your pooch is, they may end up needing more or less calories. Before we talk specifically about this breed, let’s talk about dogs in general. All dogs need proteins, fats, and carbohydrates, along with vitamins, minerals, and water. Protein ranks as the most important ingredient in any canine food, so look for high-quality proteins like chicken, turkey, and fish. Fat is important as a source of energy too, and will help give your dog a healthy coat and skin. Dogs are not able to digest a large amount of carbohydrates, but they are still important thanks to the dietary fiber, vitamins, and minerals. Just be sure you give your dog a digestible source of carbs like brown rice. The toy poodle only grows to be around 11 inches tall, weighing anywhere between 6 to 9 pounds. It’s slightly bigger counterpart, the miniature poodle, clocks in at 15 inches tall and between 15 to 17 pounds. Both of these dogs may be small, but because of their size, they’ll need a lot of energy. These dogs have very fast metabolisms and will need a good source of fat in their diet. A food specifically formulated for smaller breeds might be helpful in this case. The standard size is completely different than its smaller friends. These big pups weigh anywhere between 45 to 70 pounds, with a height of 22 inches. Less active ones will need only around 1,000 calories a day, but very active pups may need as many as 2,000. Their metabolisms are slower since they’re much larger, but the wide range of weight means that you need to monitor your standard poodle’s specific needs. Getting food with glucosamine and chondroitin in it is a great idea too when it comes to supporting bone and joint health. Now you know the nutritional requirements of your poodle, but you still need to feed them right. While your pooch is under three months it’s best if your poodle is free fed. Leave the food out, make sure it’s fresh, and rinse out the dish between feedings. Once your poodle is over three months, you’ll want to give them three meals a day. As an adult dog, your poodle, regardless of size, will usually prefer two servings a day. Only the standard poodle has a tolerance for one meal a day, although they usually like having their food in two servings as well. This can especially help to prevent bloating. Be sure to count those calories for your dog, but if you’re having trouble, refer to the instructions on the food you have chosen. That will let you know how many cups you need to scoop out for a healthy number of calories. If you decide to feed your dog natural, home-cooked food, you can start by looking at how much he eats in one sitting. Adjust the portions as necessary for your puppy to grow or your adult dog to maintain their weight. Since this breed are prone to obesity, it’s important to keep an eye on their food intake. There are so many options out there when it comes to buying food for your poodle. You might be feeling a little overwhelmed, but start first with which foods will work for your dog’s age and size. Various kibble formulas will better benefit smaller vs. larger dogs. Check on the main source of protein too, and even how large the bag is to compare value. Besides protein, check on all the ingredients in your pet’s food. Avoid fillers that lack any nutritional value, like soy protein and corn. Artificial preservatives shouldn’t be in the list either. Instead, make sure you’ve got good protein and a suitable amount of fats and carbs. Buy from a company that you trust. Look for one with a good reputation and with products made for different kinds of pets. All ingredients should be safe, with food meeting quality guidelines and nutritional requirements. There’s a lot that you have to keep in mind when you have a poodle. Food and nutritional requirements are probably at the forefront of your mind since you want to make sure that your dog remains happy and healthy. Regardless of the size of your poodle, be sure that you feed them the right food. With the proper calories, great ingredients, and a good feeding schedule, your dog will have the energy to keep running around for years to come. If you want to read more, we have a full guide on the best dog food brands!